With its colourful houses and red-tiled roofs, Salento is a beautiful town. 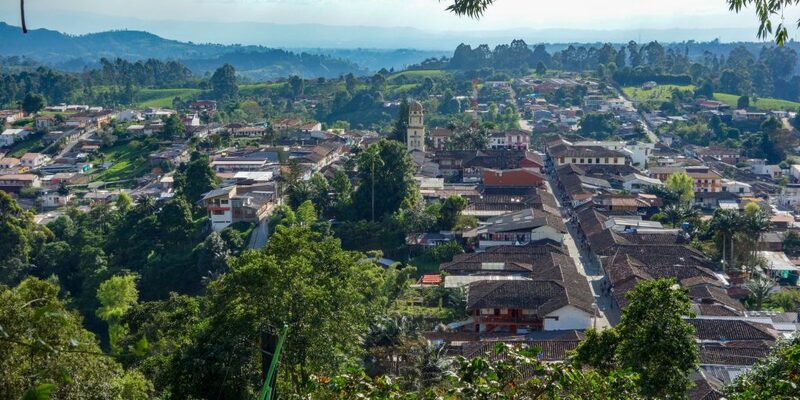 Add to that the coffee farms in the surrounding hills and the nearby Cocora Valley and you have found a little paradise. I recommend staying for at least two days so you can enjoy the region as much as I did. There are plenty of things to do in the area, and when you’re done, you can always relax in a hammock in your hostel. 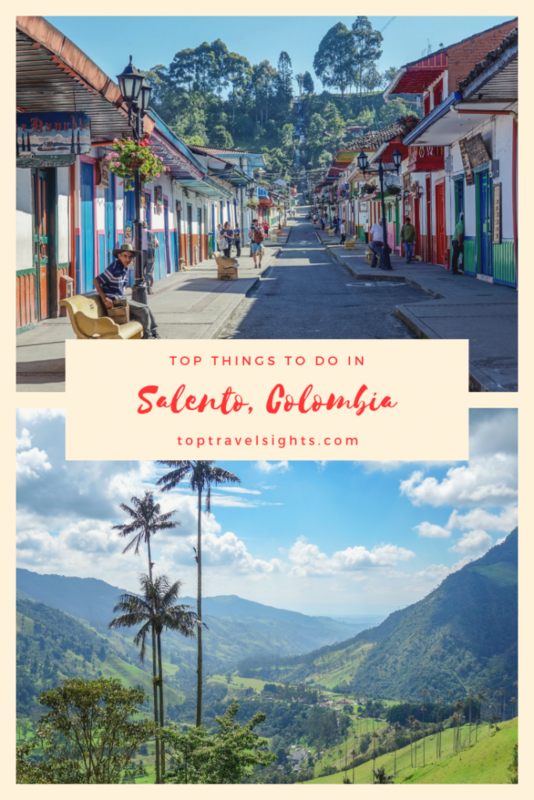 Salento is beautiful and if there is one thing you need to do while staying here, it is going for a long walk so you can fully appreciate the architecture. 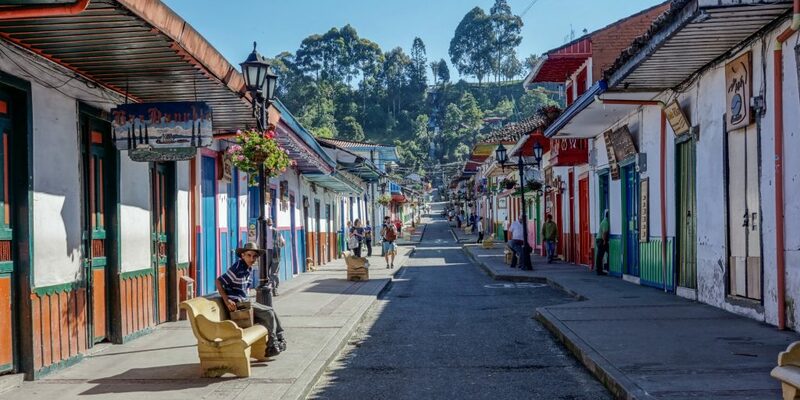 It is a town of white-washed houses decorated with colourful paintings and red-tiled roofs. I recommend starting at the main square and aimlessly wandering through the streets. Before you wander around, take a walk along the main square. Here, you cannot only find restaurants and a supermarket but also two stands selling fresh juices and fruit salads and an ice cream parlour. We went here for arroz con leche, a sweet and sticky rice pudding, that warmed us up in the cold evening. One of the most beautiful alleys goes eastwards, starting at the plaza’s northeastern corner. It is lined with souvenir shops, so if you want to buy magnets, keychains or t-shirts, this is the place to go to. If you walk northwards from the main square, down Calle 6 in the direction of the bus terminal, you end up at the food trucks. They open in the evening and offer all kind of foods, from shawarma to arepas and hot dogs. My friend got one of the Mexican hot dogs and it was huge, topped with chilli, cheese and guacamole. If you have ever seen a 100.000 pesos note, you will have noticed an image of palm trees. 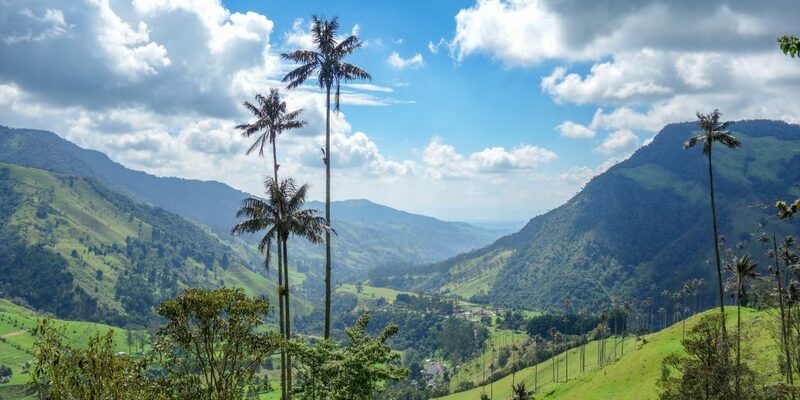 That is the Cocora Valley with its famous wax palm trees. We spent a day hiking through this lush green valley and its dense forests before arriving amongst the palm trees. The Cocora Valley can be reached by truck from Salento. The jeeps leave regularly from the main plaza and take you to a parking lot in the valley. From here, keep walking along the road. The longer path branches off to the right (follow the signs to Estrella de Agua) and takes around five to six hours. If you are short on time, keep walking along the main road and you will reach the palm trees pretty quickly. In about an hour, you can walk a short circuit and take in the views. I only recommend this if you absolutely do not have the time to stay for the hike or cannot walk long distances. The Cocora Valley is so beautiful, you should try to stay for as long as possible. 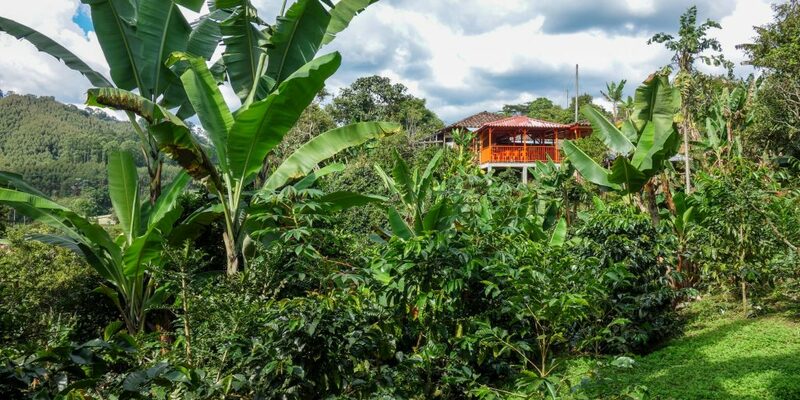 Visiting a coffee farm is one of the things you should not miss. The region around Salento was nominated a Unesco world heritage site for its coffee heritage and it would be a shame not to explore it. From Salento, walk westwards over the yellow bridge and follow the road. Expect to walk for around an hour. The first coffee plantation you come past is called Las Acacias. It is around here that you can also find a juice shack. The juice is supposed to be amazing but unfortunately, they were closed when we came past. Further down the road, you find El Ocaso. This was where we first stopped. But after being told that we would need to wait for an hour and a half for the next tour, we went on a bit farther and arrived at Don Elias coffee farm. Here, we only had to wait for five minutes. The tour took somewhere between half an hour and an hour. We walked across the plantation where we learned about the cultivation of coffee plants and also about the other plants they grow on the farm. Then, we saw the process of processing the coffee beans before getting to taste a cup ourselves. I know the sauce doesn’t look very appetizing but I promise that it’s delicious. Salento’s local specialty is trout. It comes fresh from the oven and unless you order it ‘a la plancha’, it comes in a delicious sauce. If you look around, each restauranthas their own way of preparing it, plus a few standard sauces that you can find everywhere. 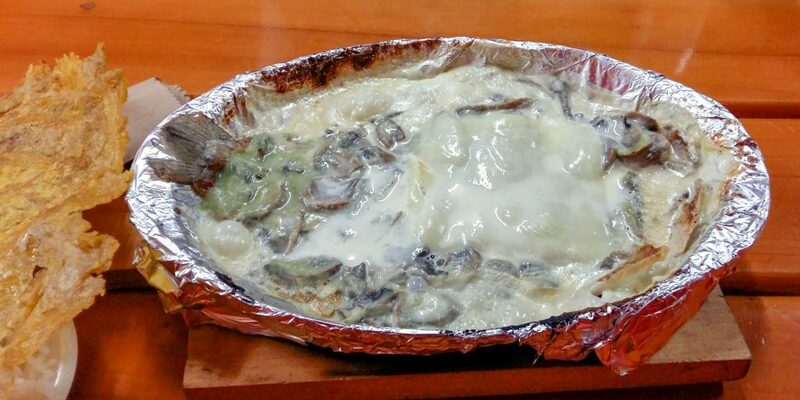 I went for garlic and mushrooms, which is supposed to be one of the more typical dishes. The fish was tender and (almost) without bones. For once, the rice that comes with every dish wasn’t dry because I could put it into the sauce. It also came with a giant piece of fried plantain. That one, to be honest, tasted like oil and not much else. But the trout was one of the best dishes I had in a long time. From the city centre of Salento, you can easily reach two view points. They are located almost next to each other and connected by a road, but offer very different views. The first one that I went to, a steep walk uphill from town, offered me a great view of the lush green valley lying behind the hill. The walk to the second viewpoint was once again uphill. But from the top, I could now see the roofs of Salento. The view made up for the climb! There are steps leading down from the second mirador to the main street, but when I came, they were under renovation so I had to backtrack. I recommend coming here in the morning. In the afternoon, clouds accumulate in the mountains and you might not be able to get a good picture. Plus, in the afternoon, you will be facing the sun when looking down on Salento, which is once again not great for taking photos. Those were my five favourite things to do in Salento. I would love to hear back from you. Have you been here? Was this guide useful to you? What did you do and what did you enjoy? Do you have any other recommendations? I’m working on lots more posts about Colombia at the moment. Keep your eyes open and make sure to subscribe so you don’t miss them.